Two goals in the space of three second-half minutes gave Crystal Palace their first home win of the season with victory over Leicester. After a dire first half, Palace took the lead six minutes into the second courtesy of a poacher's finish from Fraizer Campbell following a corner. It was 2-0 soon after as Mile Jedinak headed in a Jason Puncheon free-kick. Leicester staged a stunning comeback to beat Manchester United last week but there was to be no repeat this time. City were unchanged from the United game but a shadow of the side that pulled off a remarkable 5-3 win against Louis van Gaal's side last Sunday. In contrast, Palace once again demonstrated the pace, power and opportunistic finishing that gave them a 3-2 comeback victory six days ago at Everton, to make it two successive wins and extend their unbeaten run under Neil Warnock to four matches. However, this was only after a turgid first 45 minutes containing little excitement. Jamie Vardy scored one of Leicester's goals against United on his Premier League debut and should have had another in the 12th minute at Selhurst Park, but his shot from 12 yards was saved by Julian Speroni. At the other end, the home team had a decent spell just before the half-hour mark that yielded decent chances, the best of which was a Joe Ledley header cleared off the line by Esteban Cambiasso and a 20-yard Puncheon shot palmed away by Kasper Schmeichel. The only other notable incident before the break was a tumble from Yannick Bolasie in the box under a challenge from Ritchie de Laet that had the home fans on their feet but referee Keith Stroud shaking his head. However, the second half made up for the first as Palace came back out with the bit between their teeth and blew Leicester away with their double salvo. After Nugent had seen a shot deflected wide for the visitors, the home side struck as Scott Dann's goalward header from a corner was flicked into the net by Campbell. 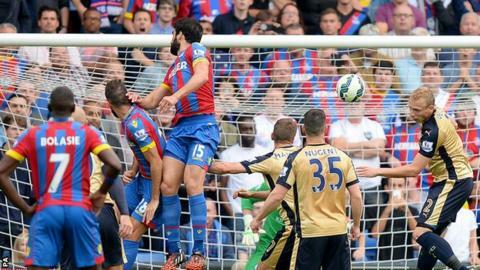 Just minutes later, Jedinak rose highest in the box to glance Puncheon's free-kick into the same side of the goal. Having shown little threat before the goals, the visitors were unable to muster anything after them and Palace, for whom substitute Marouane Chamakh went close with a late header, were able to cruise to victory. "We were under par in the second half. "You have to give them credit though. They defended with intelligence. But ultimately we had to come up with ways to break them down and couldn't find that edge." Match ends, Crystal Palace 2, Leicester City 0. Second Half ends, Crystal Palace 2, Leicester City 0. Hand ball by Adlène Guédioura (Crystal Palace). Substitution, Crystal Palace. Adlène Guédioura replaces Yannick Bolasie. Liam Moore (Leicester City) wins a free kick on the left wing. Corner, Leicester City. Conceded by Damien Delaney. Attempt blocked. Leonardo Ulloa (Leicester City) left footed shot from the centre of the box is blocked. Assisted by David Nugent. Attempt blocked. Danny Simpson (Leicester City) right footed shot from outside the box is blocked. Attempt missed. Jason Puncheon (Crystal Palace) left footed shot from outside the box misses to the right. Assisted by Joe Ledley. Attempt saved. Yannick Bolasie (Crystal Palace) right footed shot from outside the box is saved in the top centre of the goal. Assisted by Marouane Chamakh. Attempt blocked. Joel Ward (Crystal Palace) right footed shot from outside the box is blocked. Assisted by Yannick Bolasie. Attempt missed. Marouane Chamakh (Crystal Palace) header from the centre of the box is just a bit too high. Assisted by Joel Ward with a cross. Substitution, Crystal Palace. Marouane Chamakh replaces Fraizer Campbell. Attempt missed. Fraizer Campbell (Crystal Palace) left footed shot from outside the box is high and wide to the left. Assisted by James McArthur. Substitution, Leicester City. Matthew James replaces Dean Hammond. Paul Konchesky (Leicester City) wins a free kick on the left wing. Substitution, Leicester City. Riyad Mahrez replaces Esteban Cambiasso. Substitution, Leicester City. Danny Simpson replaces Ritchie de Laet. Dean Hammond (Leicester City) wins a free kick in the defensive half. Delay in match Joe Ledley (Crystal Palace) because of an injury. Corner, Crystal Palace. Conceded by Esteban Cambiasso.